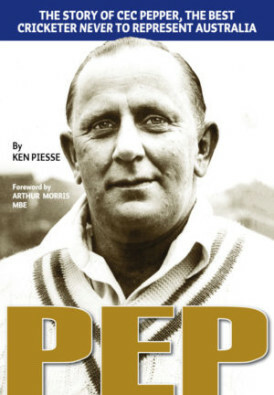 Pep is subtitled “the story of Cec Pepper, the best cricketer never to represent Australia”. After reading Ken Piesse’s book you to may well be a believer. Pep is typical of the modern cricket biography, in that it does not simply focus on the cricketer. Instead, we learn about the man, and there is a lot to glean about the complicated Pepper. As Piesse relays the Pep story, the reasons why he never played for his country become apparent and include a run in with the greatest batsmen in history, Sir Donald Bradman. It seems that just after the war, Pepper abused an umpire after his second confident appeal for LBW against the Don was turned down. A resultant umpire report and Pepper’s apology going missing appears to be all that was needed to end his chance to play Test cricket. Piesse, begins his story with the above controversy and revisits it intermittently throughout the book. Bradman the selector does not come out of Pep with his reputation enhanced, with Piesse believing Bradman could have saved Pepper’s Australian career with a simple gesture of conciliation. Apart from the Bradman incident, Pepper was also prone to abusing umpires and players, both the opposition and sometimes team-mates. He was regularly reported by officials but was usually forgiven due to his star drawing power. After his ‘card was marked’ Pepper headed to England and played in the Northern Leagues where he became the highest paid cricketer in the world. Piesse rightly points out that the big hitting and leg spinning Pepper would have made a fortune in the modern 20/20 leagues. After his retirement he joined the umpire circuit, and again his anti-authoritarian attitude cost him a chance to stand in a Test match. The private life of Pepper is also littered with controversy and it is here that Ken Piesse has excelled himself in research and sensitivity of storytelling. Pepper had three children to three different women. The last child was produced while Pepper was involved with a married couple. Piesse interviewed all three of Pepper’s children and also living family members. Given the authors level of discovery it is doubtful whether an updated biography of Pepper will ever be required. Pepper lived through an interesting period in history. Born during the Great War, he was raised in the depression and served in the Second World War, seeing active service. Piesse takes us through all of these events and in particularly the role Pepper played in the Australian Services team that played matches in England, India and Australia after the war was finished. Pepper made his name on this tour which led to team-mate and cricket legend Keith Miller labelling Pepper as the greatest all rounder in the world. After you read Pep you will agree with this assessment and also the assessment that Pepper was “the best cricketer never to represent Australia”. Pep is well written, and has lovely production values. Copious illustrations printed on quality paper, a full index and detailed statistical section. The blurb on the author tells us Ken Piesse has written or edited over 50 cricket books. I have had the pleasure of reading a large number of those and so can say with some authority that this is one of his very best. The cover of Pep describes Cec Pepper as the best cricketer never to represent Australia, and I am not going to argue with that assessment. Indeed there is a good case to be put to support the contention that he is the finest from anywhere not to have a Test cap to his name. After reading this excellent biography from Australian writer, publisher and bookseller Ken Piesse only the Philadelphian Bart King and South African opening bowler Vintcent Van der Bijl seem to be a realistic challengers for that title. Why Pepper never played Test cricket is a story that is reasonably well known. Culprit number one was what Piesse describes as Hitler, Hirohito and Company, without whose intervention in world affairs Pepper might have appeared against England as early as 1940/41. Number two was rather closer to home, the legendary Donald Bradman, with whom Pepper crossed swords in December 1945. Believing that no Test call would come as long as Bradman was in a position to influence selection Pepper signed a contract with Rochdale in the Central Lancashire League and, at 29, he had played First Class cricket in Australia for the last time. The absence of any significant First Class record is doubtless a large part of the reason why no previous biography of Pepper has appeared, but the other difficulty is who would have written it? Only an Australian writer could have had access to the material and individuals who could deal with Pepper’s first 30 years, and only an Englishman with the rest of his life. And then the internet came along, and Piesse was able to use that, and a large part of his free time whilst in England for the 2013 Ashes. Stories of Pepper abound in England even now, a quarter of a century after his death . He was a hard hitting batsman and a top class leg spin and googly bowler with a lethal flipper. He did well in those ‘big’ matches he did play in and, in the leagues, would often dominate matches by himself. He took wickets for fun in England and his sledging is legendary. Modern exponents of the art of mental disintegration with any pretence at being humorous as well as effective will almost certainly have cause to be grateful to Pepper for at least some of their material. In the manner of the times quite a few of Pepper’s comments were, to say the least, politically incorrect, but whilst he was certainly not universally popular he was by no means as unpleasant as some of his comments might suggest. Many of the anecdotes are well known, and some have doubtless gained something in the retelling, but one that sums Pepper up as well as any is one I had not heard before. Lancastrians of my generation remember “Little ‘Arry” Pilling with great fondness. It was interesting to learn that as a youngster Pilling, not much more than five feet in height, played a long innings against Pepper in the course of which he scored many of his runs with the edge of his bat. The air was blue with references to Pilling being vertically challenged, generally of a pretty offensive and crude nature. Despite the hostility he showed during the innings Pepper was, however, later spotted putting a five pound note, a significant sum of money in those days, into the collection that Pilling’s innings had earned him. According to the summary at the end of the book Ken Piesse has written 76 books, more than fifty of them on cricketing subjects. In my experience he is a decent writer although, and I hope he won’t mind me making this observation, not quite a Cardus or a Robertson-Glasgow. The quality of the writing in Pep however is certainly up a notch or two, presumably as a result of this book being a labour of love, something evidenced by the five years it took such a prolific writer to put Pepper’s story in a form he was prepared to publish. Of course the deep mine of material that Piesse worked helped enormously. A decent biography needs high quality research and, reading the acknowledgments section at the end of Pep, it becomes clear just how thorough Piesse’s preparation was. Pepper had a personal life bordering on the bizarre, and that is an aspect of his life that is fully explored. He had three sons, all by different women, with the last from a relationship that was a classic ménage a trois. All three sons contributed to the book, despite their far from straightforward relationships with their father, as did a brother and a sister. There are a couple of frustrations, one of which I suspect there was nothing Piesse could have done anything about, although the second I am sure he could have. The former is the lack of any input from or regarding the woman Pepper seems to have spent his final six months with, and who he left half of his not inconsiderable estate to. Second is how Pepper acquired that estate. Of course we know he earned a great deal as a player, but there was also a successful packaging business. There are a few references in the book, but a chapter on the subject would have been interesting. As to the book itself that is a limited edition of 400 copies, one hundred of which have been produced in boards, individually numbered and signed by Piesse, Pepper’s brother and sister and one of his three sons. The book has an excellent index, the statistics of Pepper’s First Class and club careers, and an exceptional selection of images all superbly reproduced. If I have a gripe it is that I prefer my limited editions to be bound in cloth or leather rather than illustrated boards, but Piesse has been producing his special books in his own way for a while now, so I don’t expect that observation to cut any ice!